FSR is now providing surge protection for its line of ceiling boxes as an option. This latest development offers type-2 permanently connected UL/cUL Listed Surge Protective Devices to protect branch circuits against transients in all three modes—line to line, line to neutral, and neutral to ground—serving as the initial line of defense against unwanted power surges by absorbing the energy before it makes its way into the ceiling boxes. 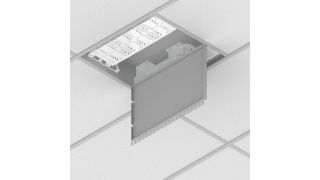 FSR’s CB Ceiling Box series comprises various units aimed at applications ranging from classrooms to conference and meeting rooms, hospitals, hotels, or any venue needing projectors or other equipment installed in ceilings. Sizes range from a 1-foot by 2-foot enclosure that installs into any standard drop ceiling and provides electrical connections, AV equipment installation, and AV and data signal routing, to deeper box cages capable of mounting two full-rack or four half-rack pieces of equipment above the ceiling.